- With tonight's Christmas Day edition of SmackDown being taped in advance, the episode featured a few backstage segments that weren't included in the spoilers for the show. 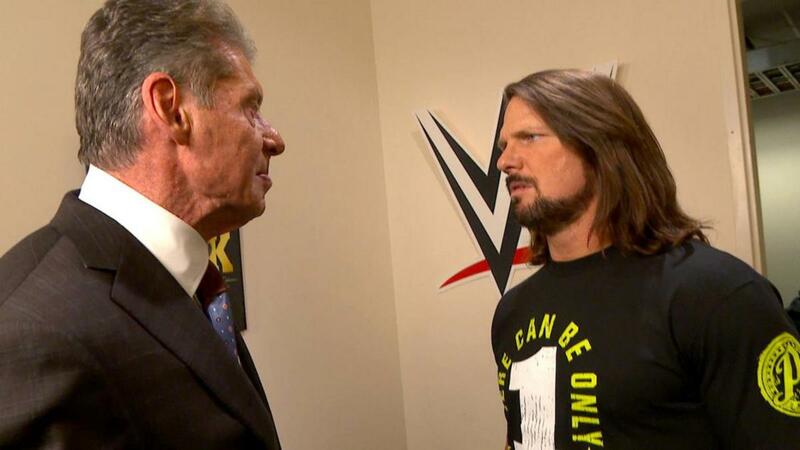 One of those aired at the end of the episode, with Vince McMahon meeting with AJ Styles backstage. The storyline was that Vince was trying to get a reaction out of Styles. Vince asked why -- if SmackDown is Styles' house -- Daniel Bryan was competing and Styles wasn't. He said he wants to know who the real Styles is. Vince mentioned that he and Styles are a lot alike -- Styles has a black hole in his heart and there's an animal inside him begging to get out. Vince said he was going to see that animal, then slapped Styles in the face. Styles responded by punching Vince in the face and knocking him down. After officials got Styles out of the room, Vince was shown on the floor smiling. A backstage segment where Bryan attacked Mustafa Ali also aired on tonight's episode, and there was another where Mandy Rose taunted Naomi by trying to flirt with Jimmy Uso. Jimmy rejected Rose and Naomi had to be held back from attacking her. - For next week's SmackDown, WWE is advertising that The New Day will hold a New Year's celebration. John Cena will also return on the episode, which is being taped at the PPG Paints Arena in Pittsburgh, Pennsylvania this Saturday and will air on New Year's Day.